U.S. and Italian forces arrested 21 people in the latest coalition operation against guerrilla fighters in eastern Afghanistan, the U.S. military said Wednesday. The arrests occurred Monday and Tuesday during Operation Dragon Fury in the Shah-e-Kot Valley, in the eastern province of Paktia, U.S. military spokesman Lt. Col. Douglas Lefforge said in a statement from Bagram Air Base. No fighting was reported. Several hundred American troops participated in the mission, which was supported by over 20 aircraft, including UH-60 Blackhawks, CH-47 Chinooks and AH-64 Apache helicopters. About 150 Italian soldiers also took part, searching 300 vehicles and inspecting 800 people, Lefforge said. Coalition troops mounted the operation to "prevent the re-emergence of terrorism, deny anti-coalition members' sanctuary, and prevent further attacks against non-governmental organizations, coalition forces and equipment," the statement said. The Shah-e-Kot Valley is the same location as the last major battle between U.S. and al Qaeda fighters in March 2002. Eastern Afghanistan has remained a hotbed for fighters opposed to the U.S.-backed government. It is across the country's eastern border than Osama bin Laden is believed to have fled into Pakistan's lawless North West Frontier Province. Meanwhile, U.S. troops were preparing to destroy a downed AH-64 Apache helicopter that crashed northwest of Orgun in nearby Paktika province on Tuesday. Two American pilots on board were uninjured in crash. The incident was not believed to have been caused by hostile fire. In the eastern town of Khost, unidentified attackers fired three rockets that exploded near a coalition base Tuesday afternoon, but no casualties or damage was reported. Farther southwest in Shkin, a border town in Paktika province, attackers sparked a gunbattle with Afghan forces, several of whom were wounded and evacuated to a U.S. base in the town. One of the soldiers was in serious condition with injuries to his liver; two others were in stable condition; and the fourth was treated and released, Lefforge said. Suspected Taliban fighters have been stepping up attacks since the start of spring, particularly in the south and east of the country. About 11,500 coalition troops, the bulk of them Americans, have been deployed in Afghanistan since the Taliban government was overthrown in a U.S.-led war in 2001. 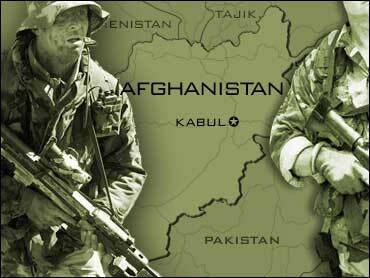 Last month, Secretary of Defense Donald Rumsfeld declared major combat operations in Afghanistan over.